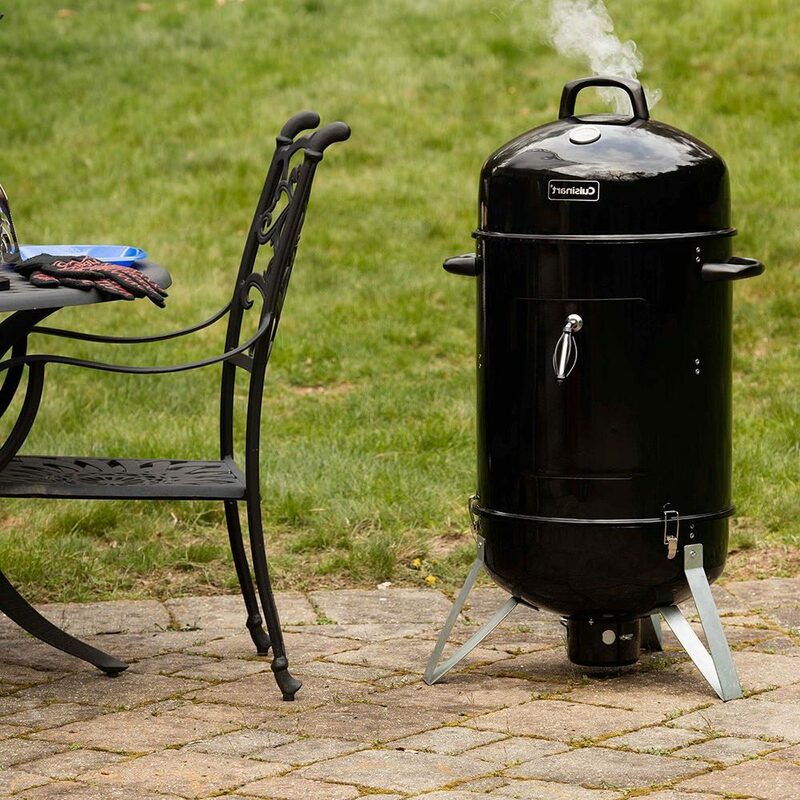 What are the best Vertical Charcoal Smokers? You can create good smoked meats using a charcoal grill but if you really want to taste something extra-ordinary, complete with authentic smoky-flavor, you will need something more than your average grill – a smoker. Although some people say that their functions are almost the same and the food they produce are somewhat similar, real BBQ meatheads know the distinction. You would not know of course, if you haven’t tried. You can smoke almost every kind of meat – ribs, steak, turkey, chicken, and smoke even vegetables. Whatever you put inside the smoker, the outcome is always good, flavorful, and juicy. If you are convinced yet that you need a smoker, read through this article to get tips on how to pick the right one, and the best brands raved about by smoking enthusiasts. 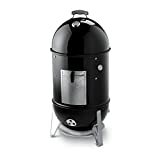 How to pick the best vertical charcoal smoker? 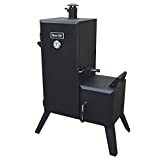 Although charcoal smokers are undeniably one of the best to pick among the different types of smokers because of its capability to give out authentic flavor, you still need to pause and examine the factors that you should look at before purchasing. Material – Look for something that has thick insulation seals. You really want to contain all the smoke inside because it’s the purpose of having a smoker. The thinner the walls and the more cracks your smoker has, the more smoke will escape that causes ineffective cooking. Thermometer – Find something that has a built-in thermometer so you’ll be able to check the temperature inside the smoker. This is good to have especially if you are going for long smokes to ensure that the temperature is maintained and that your meat is in good heated condition. Durability and Warranty – If you want something to last years of use, ensure that you have checked the quality of the materials used and the overall durability of the product. Smokers are generally expensive so make sure to splurge on something that will last you a good while. Also pick something with good warranty terms in case you receive ones with defective parts or failed quality control. Capacity – Determine who much you’ll want to cook and for how many people. If you like throwing backyard BBQ parties and is a host to more than a dozen guests, consider getting a smoker than can cook up enough food for all your guests. Get heavy-duty ones too if you intend to use it a lot. 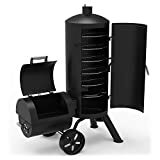 What are the recommended brands of vertical charcoal smoker? One of the best-rated charcoal smokers in Amazon, it has gained a steady following because of the quality of smoked food it can produce. Although pricey, you’ll really get a smoker that will last you a good while because of the high-quality materials used for construction. It also comes with a 10-year limited warranty. PROS: It is constructed using porcelain-enameled steel so you are sure that no smoke will escape from its vertical bullet-style body. It comes with 2 nickel-plated 18-1/2-inch-wide cooking grates that can fit a lot of large meats and food. The total cooking space you’ll get is at 481 square inches, which can fit a huge turkey in one great, and a bunch of ribs at the bottom grate. CONS: There are really no cons when it comes to the functionality, design, and sturdiness of the Weber Smokey Mountain Cooker Smoker. However, if you’ll read reviews on Amazon, what’s gaining the negative reviews is Weber’s quality control. Many people have received wrong sizes for the grates, which prevent them from using their smokers. It’s appearance looks like a cheaper version of the Weber Smokey Mountain but it functions just as well. It is made of aluminum metal as well and has a door in front for putting fuel. PROS: It comes with two grates that can hold up to 50 pounds of food. You can choose to put different types of meat on each level without worry as both tiers cook at about the same temperature. Found in the dome lid is a heat indicator for checking the temperature only in one glance. At the bottom, you will find a porcelain-enameled water pan that can be filled with any liquid you want apart from water, to give moisture and add distinct flavor to your meat. CONS: The placement of the door is not strategic as lots of smoke can escape when you have to open it to add more fuel, water, or wood chips. Apart from that, it functions well. It has an offset charcoal box design that cn be used to add more fuel without having to disrupt the main cooking chamber. This way, no smoke will escape, maximizing the heat for cooking. The main vertical smoker has six adjustable cooking grates that can hold up to 100 pounds of meat at a time. PROS: It has a built-in thermometer that lets you check the temperature inside easily, so you can have peace of mind that your meat is cooking properly. You don’t even have to watch it as it smokes; you can simply leave it if you’re going for hours of smoking and just check it from time to time. CONS: The body of this vertical charcoal smoker is prone to chipping paint and rusting. Be wary of storing it outside where the changing weathers can have a negative effect on it. Consider purchasing a cover for this smoker to extend its life. Whatever vertical charcoal smoker you choose, you are bound to have a great time with family and friends as you serve them food laced with the best smoky-flavor, thanks to the natural charcoal fuel used. Although the cleanup is a mess and cooking time is lengthened, it’s worth it because of the quality of food smokers can produce. Not to mention, the use of charcoal is also very efficient and affordable.